375 years ago saw the start of the last civil war to be fought on British soil when King Charles I raised his royal standard in Nottingham on 22nd August 1642. But what had led a ruling monarch to declare war on his own people? Charles I was a complex man who, like most people, had his good and bad points. He was a principled and conscientious ruler, believing he had been divinely appointed by God and therefore had a duty to rule for the good of the people. Yet he was also reserved, stubborn and politically unskilled. Charles believed that everyone was subject to his will, all his actions were for the good of the people and he could do no wrong as God’s chosen king. Such a belief made the need for deft political intrigue totally irrelevant in his eyes. Charles had been crowned king in 1626, and it was not long before many of his subjects began to feel uneasy about his religious beliefs and policies. England had been a Protestant country since the time of Elizabeth I, and many of the more zealous Puritan Christians were afraid that the King planned to overthrow their faith and restore Catholicism as the state religion. In 1633 King Charles sent Thomas Wentworth to Ireland as his Lord Deputy to ‘civilise’ the Irish and force them to conform to the Church of England. The titles of Irish landowners were challenged and many old plantations taken over or new ones set up with English landowners in charge. Charles had hoped that this would isolate the Catholics, but what he didn’t foresee was that the Protestant ruling elite would feel alienated too. Similar problems arose in Scotland when Charles tried to ‘manipulate’ land titles there, and things finally came to a head when he tried to introduce a version of the English Book of Common Prayer into that country, provoking riots and leading to the drawing up of a National Covenant to demand immediate withdrawal of the offending book. The Covenant was a hard-hitting tract against the authoritarian rule of Charles and tacitly implying that revolt against him would be justified. King Charles believed that the Scots had no right to oppose him and tried to crush them by force, with disastrous results. The ‘Covenanters’ overwhelmed the poorly trained English army which had been sent against them, and the king was forced to sign a peace treaty at Berwick. Charles was even more desperate to crush the opposition after this humiliation and so he summoned the English Parliament in October 1640 to ask for more funds. Unfortunately for him, Parliament took the opportunity to complain about his policies and refused to grant him funds until he had dealt with their complex grievances, some of which dated back to the beginning of his reign. Charles was furious and dissolved Parliament. The Scottish Covenanters invaded northern England again and, lacking funds, it was another poorly trained and poorly-equipped army which Charles sent north. Unsurprisingly, it was soundly beaten once again. The embattled and embittered king was forced to recall Parliament, once again leaving himself open to attack by the politicians who opposed him. The Catholic Irish and Scottish Covenanters also took the opportunity to work together and put pressure on Parliament to impeach Wentworth (who had been created Earl of Strafford by the King) because of the trouble he had caused in Ireland. The leader of Parliament, Pym, helped to organised the opposition to Stafford who was tried, found guilty, and executed. If problems in England weren’t bad enough for Charles, the Catholic Irish decided to take advantage of the situation and rebelled against their Protestant English rulers in 1641. Many Protestant English and Puritan Scottish settlers were killed and panic began to spread in England yet, rather than unifying people, it only emphasised their religious differences and the two camps – Puritan and Royalist – became even more sharply divided. Charles and Parliament argued about who should be put in charge of the army which was to be sent to crush the Irish rebels. Parliament would not agree with the king until he had addressed their grievances but Charles, believing in his divine right to rule, would not allow them to bully him and decided to raise an army himself. He believed that the Members of Parliament had tried to humiliate him once too often and needed to be put in their place; on the other hand, Parliament believed that the King would never accept their input into his rule which, in their eyes, made him a tyrant. Both sides were entrenched and there was no going back. England was irrevocably divided and embarked on the final descent into civil war. There was once a king of a northern country who had a distant claim to the throne of a country in the south. When the ruler of the southern land died childless the King of the North also became King of the South, and although there was one king to rule them both the two realms remained separate and continued with their longstanding enmities. When the king died his son came to sit on the thrones of both countries but the lords of the southern lands were not happy with how he ruled and so went to war against him. The land in the north supported the southern nobles for a time, then their support moved to the king, then shifted back to the nobles once more. Power ebbed and flowed until the king was finally captured and executed. What would happen now? Who would rule? Would the lands be united at last or continue divided and at war? Sounds like the plot to a book in the style of A Game Of Thrones, doesn’t it? Yet this is real history. The history of Scotland and England. It is a history I had to grasp to enable me to write my novel ‘The Cavalier Historian’, and it is a part of the story which many people find fascinating. So, what was the situation between the two nations in the seventeenth century and how did that impact on the English Civil War? Queen Elizabeth I, daughter of Henry VIII and granddaughter of Henry VII, died childless. The next in line to the throne was James VI of Scotland, son of Mary Queen of Scots and great great grandson of Henry VII. James VI and I (as he is sometimes known) moved from Edinburgh to London; England and Scotland were now united under one monarch BUT this was a dynastic union only, the Stuarts reigned over two separate and distinct countries even though King James wanted them to be united as one. Part of the problem which James I faced was that the Scottish Church would not accept the High Anglican Church of England. When his son, Charles I, succeeded him he introduced a Scottish version of the English Prayer Book in 1637. The Scots responded with anger and rioting, culminating in a meeting of the National Covenant in 1638 which overwhelmingly objected to the prayer book; and when the General Assembly met in November 1638 all bishops were expelled from the Scottish Church which became fully Presbyterian. Charles put together a military force to bring the Scottish to heel, but didn’t like using soldiers from his southern kingdom to invade his northern one, so a settlement was reached under the ‘Pacification of Berwick’. The peace didn’t last for long, hostilities broke out again and Charles’s English forces were defeated by the Scots at the Battle of Newburn. 22nd August 1643 Charles I raised his standard in Nottingham, formally declaring war on Parliament. August 1643 The Solemn League And Covenant promised to preserve the Scottish Church and reform religion in England and Ireland in return for Scottish help against the king. 6th May 1646 Charles I surrendered to the Scots in the hope that they would support him as their king against the old enemy, England. At the same time he was trying to negotiate with the English Parliament – unaware that the Scots were doing the same! 30th January 1647 The Scots handed Charles over to the English Parliament and he was imprisoned at Holdenby House in Northamptonshire. November 1647 The king escaped but was soon re-captured. From his prison Charles I carried out secret negotiations with the Scots, hoping for uprisings in England to coincide with an invasion from Scotland which would free him and put him back on the throne. 28th December 1647 An ‘Engagement’ was signed, with the Scots agreeing to support the king as long as he imposed the Presbyterian Church on England for three years. Spring 1648 The uprising began in Wales and England, but the Scottish forces were delayed which enabled Cromwell to put down the Royalist forces throughout most of the country although the king’s forces held out under a long siege in Colchester. When the Scots finally invaded they were defeated at the Battle of Preston on 17th – 19th August 1649. This effectively brought the Second English Civil War to an end. Charles I was in prison in England throughout this second war, and at the defeat of his forces was put on trial for treason, and executed. With the death of Charles I Cromwell invaded Scotland and brought it into his Commonwealth, but after his death Charles II became king and Scotland became an independent country once more. It wasn’t until 1707, during the reign of Queen Anne, that the ‘Acts of Union’ were signed in England and Scotland in which the two separate states with their different legislatures but with the same ruling monarch were ‘United into One Kingdom by the Name of Great Britain’. With such complex relationships between Scotland and England, as well as divisive politics and religion within England itself, it was perhaps inevitable that there would be conflict under Charles I. It is a period of history which makes for a great story and I thoroughly enjoyed the research I conducted for my novel ‘The Cavalier Historian’. I hope my readers will find the novel equally enjoyable! 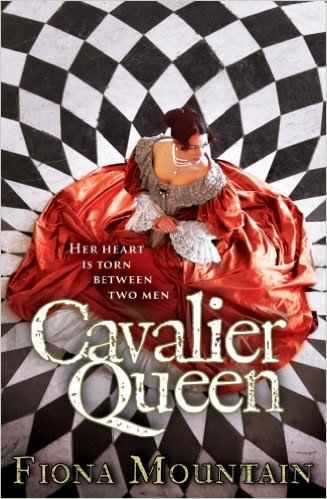 My Recommended Read for November is ‘Cavalier Queen’. It is the first book I have read by Fiona Mountain – but it won’t be the last! The English Civil War is a fascinating period of history, but the focus is usually on King Charles, or Oliver Cromwell, or Parliament. This book has a different perspective, focusing on Queen Henrietta Maria, her arranged marriage to the king, and her support for him during the war. I previously had only a superficial knowledge of Henrietta Maria’s life and loves, but this book has brought her to life for me. She was a multi-faceted woman, strong and supportive, deeply religious, loving and caring. Through her story of the queen’s life Ms. Mountain gives a good description of the reasons for the war, and Henrietta’s constant struggle to raise money and arms for the king. The raising of the Queen’s Army in the north, and its journey south to meet up with the king, is fascinating. The description of Charles’ Headquarters in Oxford is also very interesting, as is the link to France with its own political turmoil at the time. ‘Cavalier Queen’ is an incredibly well-researched novel. The care for historical detail is superb with cameos of the queen’s life, (for example meeting the daughter of Shakespeare) bringing the whole period to life. One of the key players in the queen’s household was Henry Jermyn, someone whom I knew little about but who is a key character in English history, and who also played a key role in moulding Henrietta Maria into the person she was to become. I found learning about his life just as fascinating as the life of Henrietta Maria herself. (Please remember here, though, that the book is historical fiction. Although there is plenty of primary evidence for the role that Jermyn played politically at the court of King Charles, we cannot know the details of his personal relationship with the queen.). Ms. Mountain is a skilled writer. Her characters are sympathetically drawn and believable, her dialogue realistic. The descriptions of palaces are vivid, and one feels the discomfort of those who suffered through some terrible sea crossings. ‘Cavalier Queen’ is enjoyable on so many levels – history, romance, love and duty. This is a book you can immerse yourself in; and one which, I believe, you will find difficult to put down.